Midway between Memphis and New Orleans along the Mississippi River, Vicksburg was essential to both Confederate and Union campaigns. With both sides bent on claiming the city, Vicksburg, and the fate of the nation, lay in the balance. General Ulysses S. Grant began his campaign on the city in November 1862, but he was forced to abandon the operation in December when the fiery General Earl Van Dorn made a daring raid on Grant's main supply depot at Holly Springs, Mississippi. 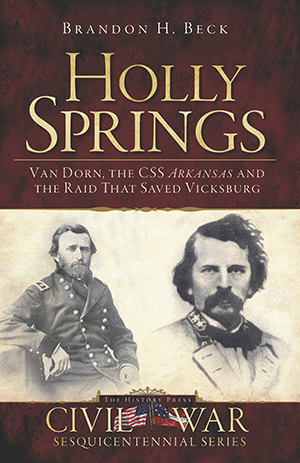 With the help of the CSS Arkansas, Van Dorn's single day raid on Grant's supply base saved Vicksburg from Grant's forces for an entire year. Historian Brandon H. Beck recounts the tactics, leaders, and legends involved in this exciting, if overlooked, chapter of Civil War history. Dr. Brandon H. Beck is the author of eight books on Civil War history. He is the founder and director of the McCormick Civil War Institute at Shenandoah University in Winchester, Virginia. He currently lives in Columbus, Mississippi, and teaches part time at East Mississippi Community College.